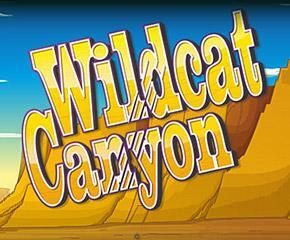 Wild Cat Canyon is a 5 reel slot game based on the theme of a serene canyon with a wild and hungry cat waiting to hunt for its food. The background sounds make you feel you are amidst nature with the cry of a vulture that echoes along with the cool breeze of the wind. You can also hear sounds of crow and cricket that add more value to the theme. With 25 paylines and 5 coin levels to choose from, you can bet anywhere from a minimum of £0.01 and go up to a max of £250 each spin. This wild theme based slot was developed by NextGen, an innovative gaming company that uses modern gaming technologies that make their games precise and more entertaining. With over two decades of their impressive stance in the casino industry, they have managed to win the hearts of millions. The bonus symbols of Wild Cat Canyon slots are the cacti, roadrunner, vulture, and a Californian striped snake of which, the vulture pays the highest of 5000 times the stake. The second highest is roadrunner that pays 1000 times the stakes followed by cacti and snake that both pay 500 times on 5 landings during a spin. The wild and furious cat along with its paw prints are the bonus symbols of the slot game. These two represent the wild and scatter features respectively. Wild Bonus: The wild symbol is represented by the roaring wildcat symbol that appears only on reels 2 and 4. This is a substitute for all the other symbols during a winning combination but does not cover for scatter symbol. 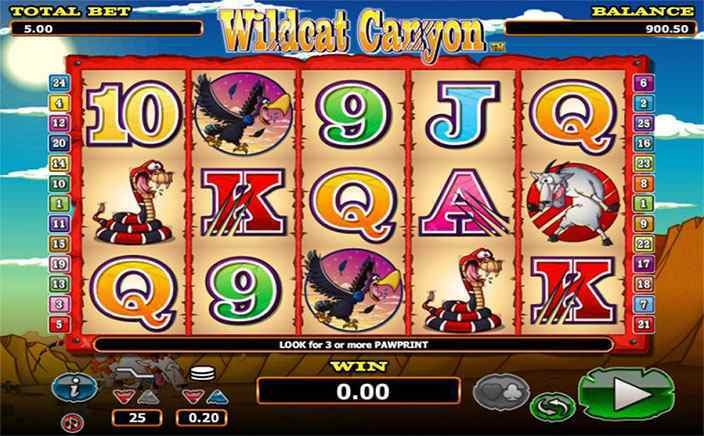 Scatter Multiplier: The paw print of the wildcat animal is the scatter feature of Wild Cat Canyon and it multiplies your total bet by up to 200 times with five landings anywhere on the slot. 4, 3 & 2 number of appearances gives you 15, 5 & 2 times your total bet. Free Spins: The scatter symbol also offers free spins on three or more of its appearances. Free spins here work little differently as you get to choose the number of spins but there is a catch to it. Larger the number of spins, lower the number of times the wild multiplies your wins. With lots of fun and entertainment throughout the gameplay, Wild Cat Canyon slots offer several bonuses and winning chances that can make you rich when played with high stakes.